The German language is so perfectly suited for these syndromes, coming down with them in any other language just won`t do. 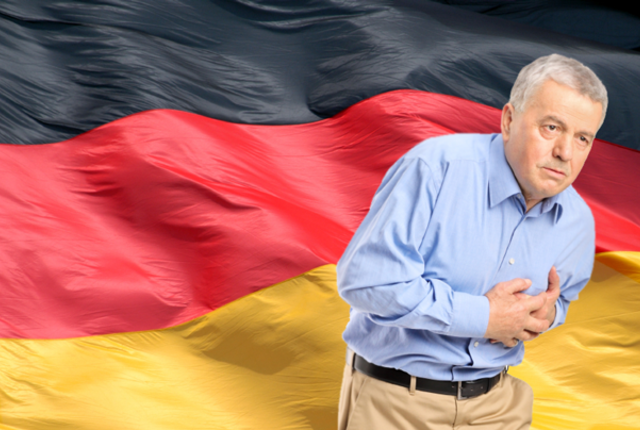 At some point in the last couple of decades, parents in Germany started coming down withKevinismus – a strange propensity to give their kids wholly un-German, American-sounding names like Justin, Mandy, Dennis, Cindy, and Kevin. Kids with these names tend to be less successful and have more behavior problems in school. Studies of the Kevinismusphenomenon attribute these effects to a combination of teachers` prejudices toward the names, and the lower social status of parents who choose names like Kevin. Föhn is the name for a specific wind that cools air as it draws up one side of a mountain, and then warms it as it compresses coming down the other side. These winds are believed to cause headaches and other feelings of illness. Many a 19th century German lady took to her fainting couch with a cold compress, suffering from Föhnkrankheit. Kreislaufzusammenbruch, or „circulatory collapse”, sounds deathly serious, but it`s used quite commonly in Germany to mean something like „feeling woozy” or ”I don`t think I can come into work today”. Hörsturz refers to a sudden loss of hearing, which in Germany is apparently frequently caused by stress. Strangely, while every German knows at least 5 people who have had a bout of Hörsturz, it is practically unheard of anywhere else. Frühjahrsmüdigkeit or „early year tiredness” can be translated as „spring fatigue”. Is it from the change in the weather? Changing sunlight patterns? Hormone imbalance? Allergies? As afflictions go, Frühjahrsmüdigkeit is much less fun than our „spring fever”, which is instead associated with increased vim, vigor, pep, and randiness. Fernweh is the opposite of homesickness. It is the longing for travel, or getting out there beyond the horizon, what you might call…awaysickness. Putzen means â€œto cleanâ€ and Fimmel is a mania or obsession. Putzfimmel is an obsession with cleaning. It is not unheard of outside of Germany, but elsewhere it is less culturally embedded and less fun to say. An old-fashioned type of miserable lovesickness that was named „Werther`s fever” for the hero of Goethe`s The Sorrows of Young Werther. Poor young Werther suffers for the love of a peasant girl who is already married. Death is his only way out. A generation of sensitive young men brought made Werthersfieber quite fashionable in the late 18th century. Ostalgie is nostalgia for the old way of life in East Germany (â€œostâ€ means East). If you miss your old Trabant and those weekly visits from the secret police, you may have Ostalgie. Zeitkrankheit is „time sickness” or „illness of the times”. It`s a general term for whatever the damaging mindset or preoccupations of a certain era are. Weltschmerz or „world pain”, is a sadness brought on by a realization that the world cannot be the way you wish it would be. It`s more emotional than pessimism, and more painful than ennui. Ichschmerz is like Weltschmerz, but it is dissatisfaction with the self rather than the world. Which is probably what Weltschmerz really boils down to most of the time. Zivilisationskrankheit, or „civilization sickness” is a problem caused by living in the modern world. Stress, obesity, eating disorders, carpal tunnel syndrome and diseases like type 2 diabetes are all examples. Torschlusspanik or „gate closing panic” is the anxiety-inducing awareness that as time goes on, life`s opportunities just keep getting fewer and fewer and there`s no way to know which ones you should be taking before they close forever. It`s a Zivilisationskrankheit that may result in Weltschmerz, Ichschmerz or Lebensmüdigkeit. PreviousPrevious post:Job information for foreign doctors in SaxonyNextNext post:What is psychosomatic medicine?